Amazon.com description: Product Description: In this book, award-winning educator Kieran Egan shows how we can transform the experience of K-12 students and help them become more knowledgeable and more creative in their thinking. At the core of this transformative process is imagination which can become the heart of effective learning if it is tied to education's central tasks. 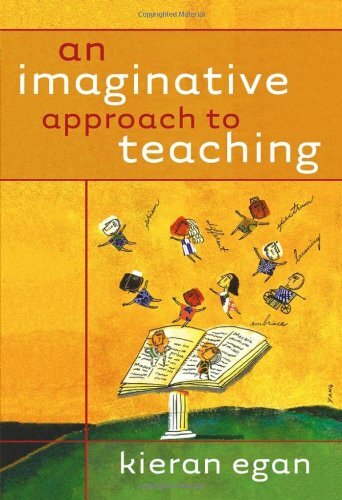 An Imaginative Approach to Teaching is a groundbreaking book that offers an understanding of how students' imaginations work in learning and shows how the acquisition of cognitive tools drives students' educational development. This approach is unique in that it engages both the imagination and emotions. The author clearly demonstrates how knowledge comes to life in students' minds if it is introduced in the context of human hopes, fears, and passions. To facilitate this new educational approach, the book includes a wide variety of effective teaching tools - such as story, rhythm, play, opposition, agency, and meta-narrative understanding - that value and build upon the way children understand their experiences. Most important, Egan provides frameworks for lesson planning and more than a dozen sample lessons to show how teachers can use these tools to awaken intelligence and imagination in the classroom. About: In this book, award-winning educator Kieran Egan shows how we can transform the experience of K-12 students and help them become more knowledgeable and more creative in their thinking.